WPIA offers Fixed Wireless Broadband, a radio-wave-based technology. With Fixed Wireless Broadband, there's no need to have a phone line or Cable TV to get high-speed access to the internet. The connection to the internet is a direct, permanent connection that's always available. Can I use multiple computers on one Fixed Wireless Broadband connection? Yes. The Wireless receiver has an Ethernet interface. All you need is an inexpensive Ethernet router and some cabling, which is available at most retail computer outlets, and you can connect all the computers in your home or office to the one Fixed Wireless Broadband receiver. If you purchase the router from WPIA the technicains will install and configure it at no charge. Does it matter what Operating System I use? No. Fixed Wireless Broadband will work with any Operating System (OS) that supports Ethernet Networking, including: Windows; Linux; Macintosh; or OS/2. Please see your OS instructions or consult the manufacturer of the OS for details. Also, you should always verify PC requirements with your Internet Service Provider (ISP). Is Fixed Wireless Broadband available in my area? 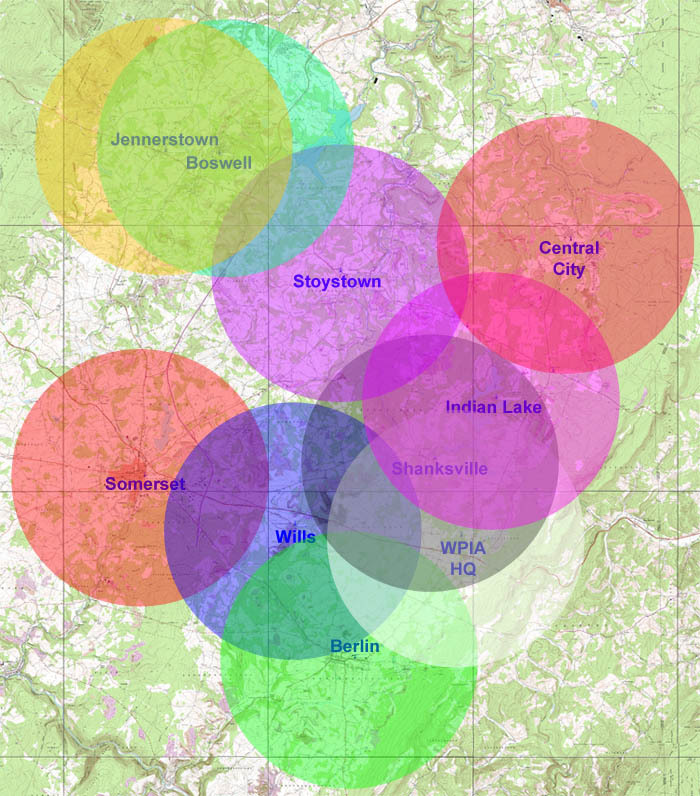 Fixed Wireless Broadband is available currently to customers in the Berlin, Shanksville, the WPIA Office Location, Central City, Indian Lake, Somerset, Wills, Stoystown, Jennerstown, and Boswell areas. You can find a coverage map below. Contact our office for pricing and information.